from naturalsociety.com: Even if you aren’t opposed to genetically modified crops (with all this information, how couldn’t you be) and even if you like Bill Gates and his ventures (but with all this information, how could you), this latest should be enough to get you perturbed. And if you are anti-GMO and knowledgeable of the shady and questionable ways of the Gates Foundation, this latest story out of Africa will truly make your blood boil. According to a recent statement from the African Centre for Biosafety (ACB), failed GM corn from Monsanto is now being pushed on African countries with help from the Gates Foundation. This maize, known as MON810, has been grown in South Africa for 15 years, where it “failed miserably”. But so as not to call the seed a complete waste, Monsanto and Bill Gates are now pushing it into countries like Mozambique, Uganda, Tanzania, and Kenya—countries that need agricultural help. 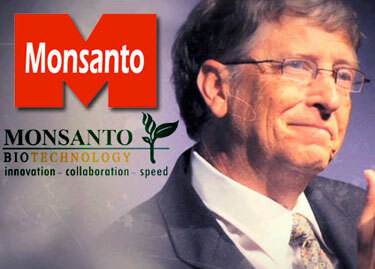 Now, to not waste the waste of a seed, Monsanto has donated the MON810 technology to a “philanthropic” venture of the Gates Foundation and Monsanto called Water Efficient Maize for Africa (WEMA), and they’ve done it royalty-free. For small African farmers with few resources, WEMA was seen as a positive thing, providing seeds that could withstand harsh conditions. But now, drought-tolerant varieties aren’t the only seeds being pushed onto the continent. Kenya and Uganda have already begun field trials on MON810. Mozambique is changing their biosafety laws to allow the GM crop and WEMA is putting pressure on Tanzania to do the same. Currently, Tanzanian biosafety laws allow Monsanto to be held “strictly liable” for damages that could arise from the use of MON810; WEMA is understandably opposed to this. After all, they know the dangers associated with their crops even if they don’t want to admit it. Interestingly, and frighteningly, MON810 has been genetically altered into a variety of Egyptian corn known as “Ajeeb Yieldgard” which has already been patented by Monsanto and approved for commercial growing while circumventing Egyptian biosafety laws. The Egyptian government itself has published peer reviewed studies indicating the risk of MON810 to human and animal health. “The scariest revelation is that GM producers and regulatory authorities are making it all up as they go along, while the massive biotech PR machinery spreads the myth that these crops are connected to feeding the poor in Africa."